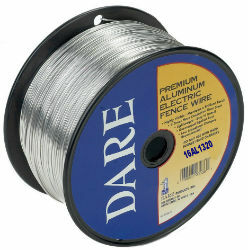 Aluminum electric fence wire is four times more conductive than galvanized steel and more visible. Lightweight and easy to install. Guaranteed against rust. Do not use with a weed burner style of charger. Recommended for use with a low impedance type energizer.